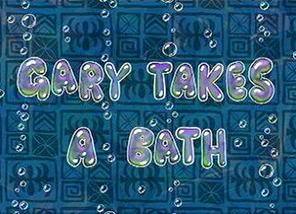 Gary Takes a Bath (Episode) – From SpongePedia, the biggest SpongeBob-wiki in the world! It is Gary's bath-time, but he is too lazy to take a bath. SpongeBob thinks of ways to get Gary to come to the bath. He pretends to be a pirate and leads him to the bathroom. Then he tries to get Gary in the tub, but he doesn't succeed in throwing Gary in the tub because of his slimy skin. Finally SpongeBob absorbs the bathwater and chases Gary around, trying to wash him, but eventually gets stuck on a tree. SpongeBob falls off the tree and gets covered in mud, and Gary makes him take a bath. This episode is not on Nick UK. It was banned. But after 7 years on October 31, 2008 this episode was aired in the UK along with episode Shanghaied. This is the only episode that had only one voice actor, which was Tom Kenny. On this episode when SpongeBob plays leap frog with Gary and launches him to the bathroom it shows the bathroom on the bottom level of the house but it is revealed further in the episode that it is on the second level of the house. When SpongeBob is talking to Gary about the buried treasure, in the house they are in a room with a metal background but when it has a closeup on the map there is a bamboo background. In Mexico, the hillbilly girl part was erased. This episode was almost banned in the United States because the hillbilly-like girl that appears in the beginning of the episode could be frightening to younger children. But, the episode didn't get banned for unknown reasons. But this episode WAS banned in Australia. This page was last modified on 10 April 2011, at 19:58.